Toddlers do some weird things. They're simply just learning so much, so fast. They're learning to try new things and they are learning to reason. To us, their reason is a little bit strange, but to them it's completely normal. 1. Asking the same question over and over until they get an answer they want. "What you doing?" Cutting up onions. "What you doing?" Cutting up onions for our dinner. "WHAT you doing?" If she asks too many times I just throw out a weird answer and that usually does the trick. "The onions need to be skinny so we can eat them." They will deny that they just atomic bombed their pants just so they can keep playing. 3. Wanting to be held just for the sake of being held. "Hold you?" my daughter says. 4. Sweetly knocking on the bathroom door because they want to come in. "Open the door!" "Please. Open the door." 5. Eating their food weird. Umm, my daughter peels open her peanut butter sandwich and eats the peanut butter off, then rolls up the bread and eats that. She also prefers to eat her oranges while sitting on the floor. And berries need to be in a bowl so she can eat them with a spoon. 6. Wanting to use the car shopping cart at the grocery store every. single. time. Do you know how hard those things are to steer? But she actually thinks she's driving. I can't say no. 7. Saying "Is that daddy?" to random men. For real. Usually I get a smirk from them. Sometimes I can feel their secondhand embarrassment. This is number one on my list of "ways to make me wish I had an invisibility cloak". Okay, let's hear from you. What does your toddler do that is just too cute to be annoyed with? Toddler days are tough but I will miss them! I don't miss the not sleeping part at all! So glad those diaper change quirks arent exclusive to my daughter! She'll RUN away from me if I tell her she needs a change, and will continue to insist that she doesn't need it just to salvage playtime. My daughter has some weird habits as well. PBJ sandwiches are eaten without crusts, she eats the jelly side first then the peanut butter one...very strange. Thank you for sharing this, Lauren! 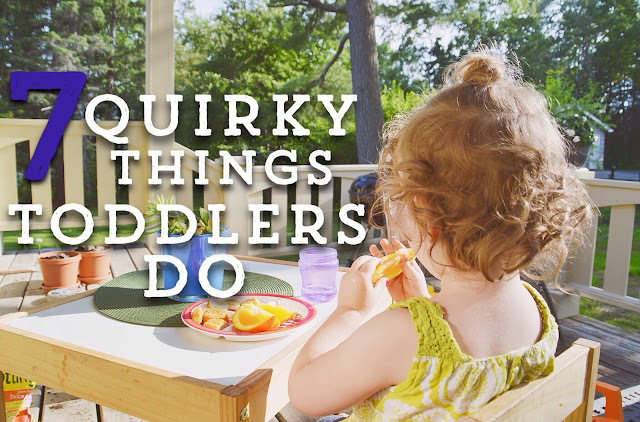 Toddlers do have a quirky side to them. Haha weird how your daughter eats her PB & Js similarly. And I'm laughing at the diaper change comment because mine RUNS too! Thanks for stopping by! I can relate to number 5. My 3 year old tares apart his peanut butter sandwich and licks all the peanut butter off before eating the bread. He also likes to have his head covered with a blanket. Winter or summer he likes to be under a blanket, looking at books playing with his Leap Pad, or little people. The blanket thing is so random! I wonder why he does that?? The holding and snuggling is the BEST! Especially after a really long and hard day! When I ask my son a question his automatic response is "No" and then he answers. Toddlers really do tons of weird things lol! My son recently has taken to only eating peanut butter on a spoon, he have to start hiding the jar from him. Gotta love kids and the awesome things they say! My daughter is still too young to really talk besides a few random words but I can only imagine the random things she'll say when she can.